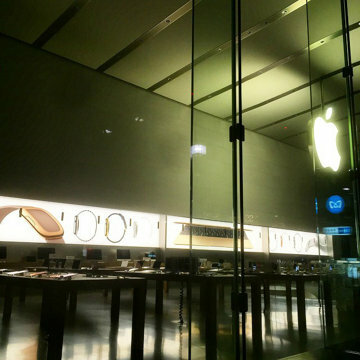 Apple Stores around the world installed new backlit displays Thursday night, showing off the company's latest and greatest products, including the Apple Watch and an all new ultra-thin 12-inch MacBook with Retina display. Apple's latest in-store displays are in line with recent iPhone and iPad product placements that use enlarged close-up photographs to show off physical device features in exquisite detail. In the image above, Apple showcases the Apple Watch Edition's modern buckle leather strap with solid gold clasp. Apple is apparently pushing Apple Watch accessories, as other images show the milanese loop alongside examples of all three Apple Watch tiers. 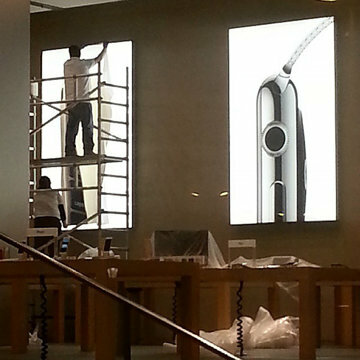 Taking a spot next to Apple Watch in many Apple Store installations is the new 12-inch MacBook with Retina display. Here Apple puts an emphasis on the new ultralight's thinness, touting profile shots and views of the device's keyboard taken from extreme angles. Apple is also advertising MacBook's new color options, which now include gold and Space Gray along with the usual raw anodized aluminum. Both products are slated for release in April, with Apple Watch preorders and in-store previews starting on April 10, the same day Apple's MacBook is set to hit store shelves. Apple Watch makes its way to market on April 24 debut.